The Ryan budget proposal achieves the bulk of its savings by cutting health care outlays, particularly Medicare and Medicaid. The mechanism sounds a lot like a firm’s transition from a defined benefits pension plan to a defined contribution scheme. Medicaid becomes a system of block grants to states, and Medicare becomes a system of flat-rate vouchers. Along the way, it has some useful aspirations: to separate health insurance from employment and eliminate health’s favored tax status. Reading some of the finer print, though, I don’t think it really fixes the fundamental flaws of the current system. It’s billed as “universal access” but that’s a misnomer. It guarantees universal access to a tax credit or voucher that can be used to purchase coverage, but not universal access to coverage. That’s because it doesn’t solve the adverse selection problem. As a result, any provider that doesn’t play the usual game of excluding anyone who’s really sick from coverage (using preexisting conditions and rotating plan changes) will suffer a variant of the utility death spiral: increasing costs drive the healthy out of the plan, leaving it to serve a diminishing set of members who had the misfortune to get sick, at an escalating cost. Universal access to coverage is left to the states, who can create assigned risk pools or other methods to cover the uncoverable. Leaving things to the states strikes me as a reasonable strategy, because the health system is so complex that evolutionary learning is likely to beat the kind of deliberate design we’ll get out of congress. But it’s not clear to me that the proposal creates any real authority to raise money to support these assigned risk pools; without money, the state mechanisms will be rather perfunctory. Prevention beats cure by a long shot, in terms of both cost and quality of life. In the current system, patient churn through providers eliminates most of the provider-side incentive to address this. Patients have contributed by abdicating responsibility for their own health, and insurance exacerbates the problem by obscuring the costs of the quadruple bypass that follows from a life of Big Macs. In some circumstances, the health care system is capable of expending an extremely large amount of resources on a person – sometimes for a miraculous outcome, and sometimes for rather marginal end-of-life extension. What’s needed is a distributed way to share risk (which is why it’s called insurance), while preserving incentives for good behavior and matching total expenditures to resources. That’s a tall order. It’s not clear to me that the Ryan proposal tackles it in any serious way; it just extends the flaws of the current system to Medicare patients. Per capita annual medical expenditures from the MEPS panel, by age and income. There’s surprisingly little variation by income, but a lot by age. 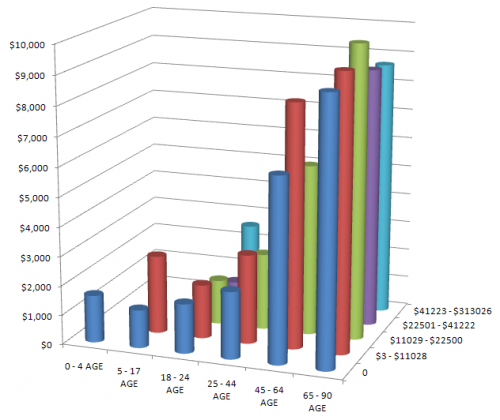 The bill terminates the agency that collects this data. 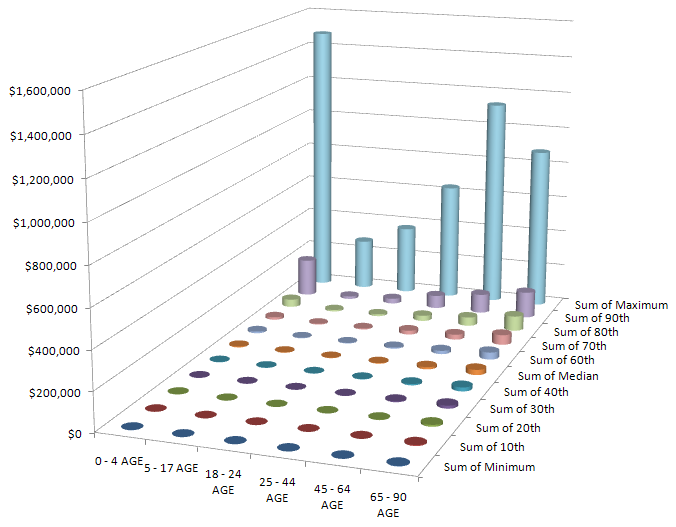 Health expenditures by age and decile of cohort, showing the extreme concentration of expenditures at all ages. The really fine print, the text of the bill itself, is daunting – 629 pages. This strikes me as simply unmanageable (like the deceased cap and trade legislation). There are simply too many opportunities for unintended consequences, and hidden agendas, in such a multifaceted approach, especially with the opaque analytic support available. Surely this could be tackled in a series of smaller bites – health, revenue, other expenditures. It calls to mind the criticism of the FAA’s repeated failure to redesign the air traffic control system, “you can’t design a system that evolved.” Well, maybe you can, but not with the kind of tools and discourse that now prevail. Domino’s Pizza was hurting early last year. Domestic sales had fallen, and a survey of big pizza chain customers left the company tied for the worst tasting pies. Then help arrived from an organization called Dairy Management. It teamed up with Domino’s to develop a new line of pizzas with 40 percent more cheese, and proceeded to devise and pay for a $12 million marketing campaign. But as healthy as this pizza has been for Domino’s, one slice contains as much as two-thirds of a day’s maximum recommended amount of saturated fat, which has been linked to heart disease and is high in calories. And Dairy Management, which has made cheese its cause, is not a private business consultant. It is a marketing creation of the United States Department of Agriculture — the same agency at the center of a federal anti-obesity drive that discourages over-consumption of some of the very foods Dairy Management is vigorously promoting. The dairy industry has become a master at exercising these points, in particular using #4 and #5 to influence #6, resulting in interesting conflicts about #3. 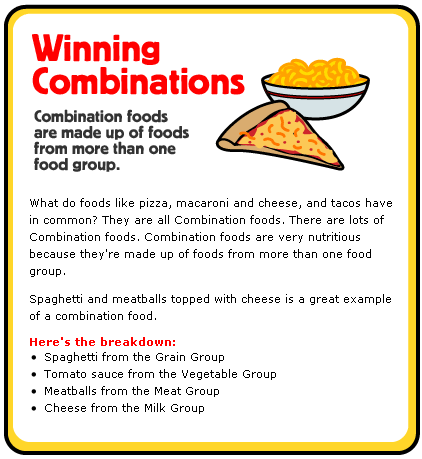 That slice of “combination food” doesn’t look very nutritious to me, especially if it’s from the new Dominos line DM helped create. Notice that it’s cheese pizza, devoid of toppings. And what’s the gratuitous bowl of mac & cheese doing there? Elsewhere, their graphics reweight the food pyramid (already a grotesque product of lobbying science), to give all components equal visual weight. This systematic slanting of nutrition information is a nice example of my first deadly sin of complex system management. Flavored milk contributes only small amounts of added sugars to children ‘s diets. Sodas and fruit drinks are the number one source of added sugars in the diets of U.S. children and adolescents, while flavored milk provides only a small fraction (< 2%) of the total added sugars consumed. It’s tough to fact-check this, because the citation doesn’t match the journal. But it seems likely that the statement that flavored milk provides only a small fraction of sugars is a red herring, i.e. that it arises because flavored milk is a small share of intake, rather than because the marginal contribution of sugar per unit flavored milk is small. Much of the rest of the information provided is a similar riot of conflated correlation and causation and dairy-sponsored research. I have to wonder whether innovations like flavored milk are helpful, because they displace sugary soda, or just one more trip around a big eroding goals loop that results in kids who won’t eat anything without sugar in it. Elsewhere in the dairy system, there are price supports for producers at one end of the supply chain. At the consumer end, their are price ceilings, meant to preserve the affordability of dairy products. It’s unclear what this bizarre system of incentives at cross-purposes really delivers, other than confusion. The fundamental problem, I think, is that there’s no transparency: no immediate feedback from eating patterns to health outcomes, and little visibility of the convoluted system of rules and subsidies. That leaves marketers and politicians free to push whatever they want. So, how to close the loop? Unfortunately, many eaters appear to be uninterested in closing the loop themselves by actively seeking unbiased information, or even actively resist information contrary to their current patterns as the product of some kind of conspiracy. That leaves only natural selection to close the loop. Not wanting to experience that personally, I implemented my own negative feedback loop. I bought a cholesterol meter and modified my diet until I routinely tested OK. Sadly, that meant no more dairy. Citation: Jeppe Sturis, Kenneth S. Polonsky, Erik Mokilde, and Eve van Cauter. 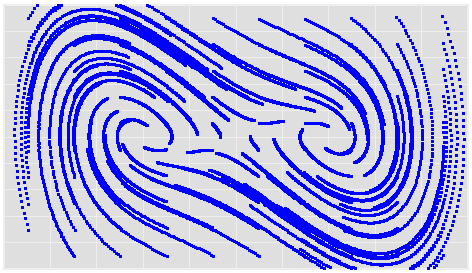 Computer Model for Mechanisms Underlying Ultradian Oscillations of Insulin and Glucose. Am. J. Physiol. 260 (Endocrinol. Metab. 23): E801-E809, 1991. Further refined, for initialization in equilibrium (insulin by analytic expression; glucose by parameter). Glucose infusion turned on by default. Graphs added. OK, I’ve stolen another title, this time from a favorite kids’ book. This post is really about the thyroid, which is a little less catchy than the spleen. They stir your body up. and give your body pluck. This is the part of the system that’s typically involved in the treatment of hypothyroidism with synthetic hormone replacements. Normally, the body runs a negative feedback loop in which thyroid hormone levels (T3/T4) govern production of TSH, which in turn controls the production of T3 and T4. The problem begins when something (perhaps an autoimmune disease, i.e. 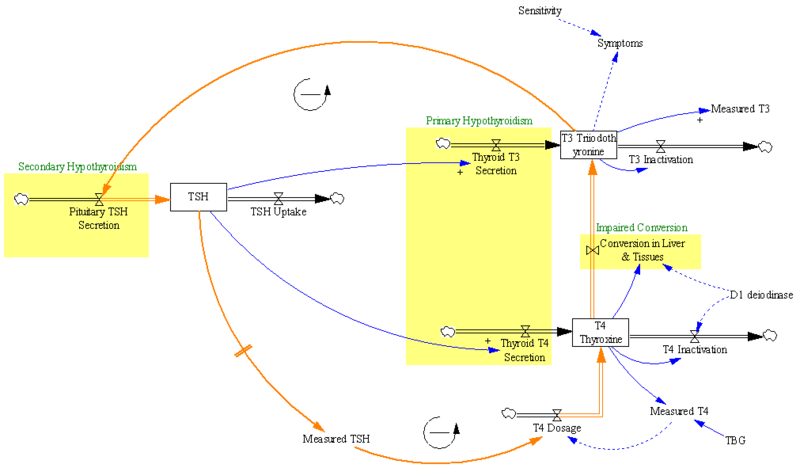 Hashimoto’s) diminishes the thyroid’s ability to produce T3 and T4 (reducing the two inflows in the big yellow box at center). Then therapy seeks to replace the natural control loop, by adjusting a dose of synthetic T4 (levothyroxine) until the measured level of TSH (left stock structure) reaches a desired target. This black box approach to control is probably effective for many patients, but it leaves me feeling uneasy about several things. The “normal” range for TSH varies by an order of magnitude; what basis is there for choosing one or the other end of the range as a target? Wouldn’t we expect variation among patients in the appropriate target level? How do we know that TSH levels are a reliable indicator, if they don’t correlate well with T3/T4 levels or symptoms? Are extremely sparse measurements of TSH really robust to variability on various time scales, or is dose titration vulnerable to noise? One could imagine alternative approaches to control, using direct measurements of T3 and T4, or indirect measurements (symptoms). Those might have the advantage of less delay (fewer confounding states between the goal state and the measured state). But T3/T4 measurements seem to be regarded as unreliable, which might have something to do with the fact that it’s hard to find any information on the scale or dynamics of their reservoirs. Symptoms also take a back seat; one paper even demonstrates fairly convincingly that dosage changes +/- 25% have no effect on symptoms (so why are we doing this again?). 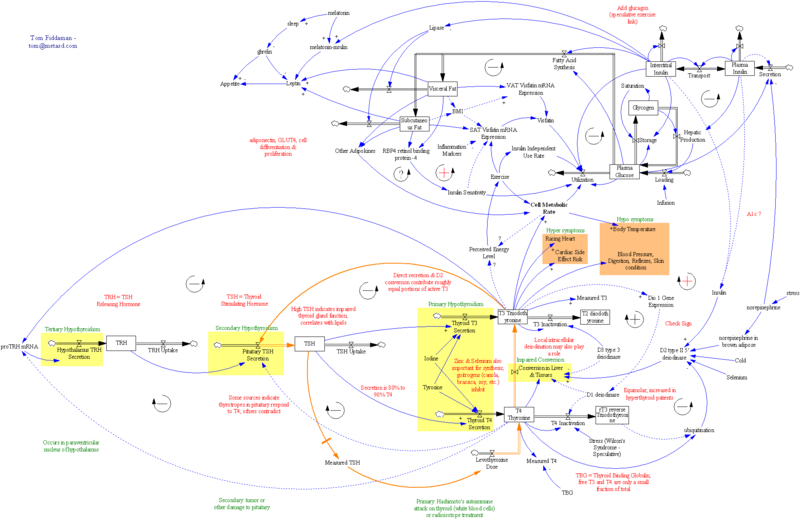 I’d like to have a more systemic understanding of both the internal dynamics of the thyroid regulation system, and its interaction with symptoms, behaviors, and other regulatory systems. Here’s hoping that one of you lurkers (I know you’re out there) can comment with some thoughts or references. A poem ugly as a spleen. Like 3.5 … pounds of liver. Tie your intestines in a bunch. Like a stomach or a colon. Why you turning green, good buddy? It’s just human body study.